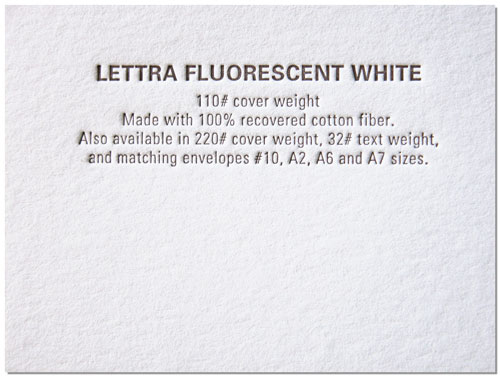 Lettra paper stocks are designed for letterpress. Fluorescent White is a bright white and looks much lovelier in your hand than in the image above. Made with 100% cotton fiber recovered from the textile industry. Choose from 110# cover or double-weight 220# cover. Also available in 32# text weight and matching #10, A2, A6 and A7 sized envelopes, for use in stationery and identity projects. Lettra Pearl White has the same soft fluffy surface and a warm off-white color. 220# cover weight allows for a deeper letterpress bite impression on both sides of a piece without the impression showing through to the opposite side. 220# is recommended for 2-sided productions. Also available in 110# cover which is very suitable for single-sided business cards, folded cards, invitations and many other uses. Comes in 32# text weight and matching #10, A2, A6 and A7 envelopes as well. 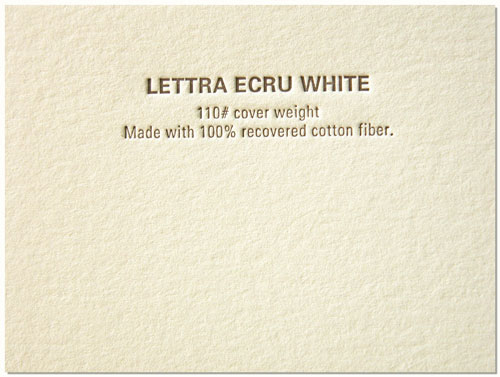 Lettra Ecru White is very rich and golden in color. 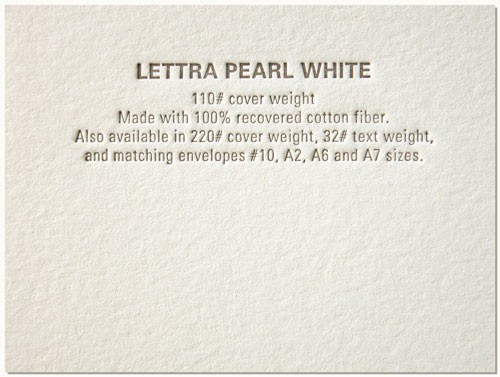 100% rag cotton papers produce a classic letterpress look. Ecru While is only available 110# cover weight.